The Orange Order moved north with the first English protestant settlers from southern Ontario to come to Nipissing District. In North Bay the first lodge was organized in 1888. J.W. Richardson was first Master and served as such for nine of the first seventeen years of the organization. Lodge 876 remained active well beyond its 100 th anniversary. In 2004, however, the building which had housed the Orange Lodge was sold and all of its contents had to be removed. This included the records not only of the North Bay Lodge but of several other Lodges in the area as well. A chance meeting with the Grand Secretary by Fran�oise No�l and Stephen Tomlinson in Ethel , Ontario , led to discussions with the local secretary, Herb Kannegiesser, and eventually to the donation of the records to the ICSOH at Nipissing University. The records include 100 items, 78 of which are roll books, minute books, ledgers and membership ledgers. The earliest material is the Roll Book for Lodge 758 in Powassan which dates from 1889. A Minute book for the Nipissing County Orange Lodge, East and West Nipissing District covers the period from 1893 to 1937. The oldest minutes from North Bay Lodge 876 are those of 1905 to 1909. These appear to be complete although no records of Membership and Minutes exist for the period from 1915 to 1920. The minutes extend all the way to 1997. Ledgers and Roll books for the higher degrees like the Royal Arch Purple and the Blue and the Royal Blue also extend across this period. 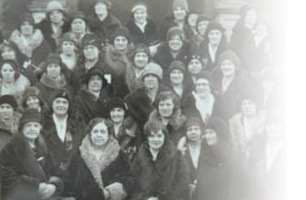 The Lady Patricia Lodge of North Bay , Lodge 256, organized the wives of Orangemen into their own organization. Their records in this collection extend from 1918 to the 1950s. Some documents are included from Lodges 441, 140, and 758 in Powassan. There are several books from Lodge 762 starting in 1909. Other records are from Lodge 1323, 1682, 2189, 2992, D83. The regional records refer to Lodges 1100, 1283, 1088, 1055, 1070, 876, and 429. A number of photographs and other framed items are also part of the collection. The collection is currently held in the Archives Room in the Library of Nipissing University. It is accessible to researchers who report to the library staff and indicate their interest.